The Northern Saw-whet Owl (Aegolius acadicus) is a nocturnal owl species with a large breeding range within the boreal forest including the forest that surrounds Lesser Slave Lake. Northern Saw-whets are confirmed breeders in the Lesser Slave Lake Provincial Park, but their breeding density is unknown. Many banding stations across Canada are now monitoring the fall migration of the Northern Saw-whet Owl. The method used to capture the owls is simple and produces good results. The LSLBO operates four mist nets on a nightly basis during the months of September and October. Owls are lured into the nets using a playback of their breeding call. This nightly banding in conjunction with observations is used to determine long term population trends of Northern Saw-whet Owls along the northeastern shoreline of Lesser Slave Lake. 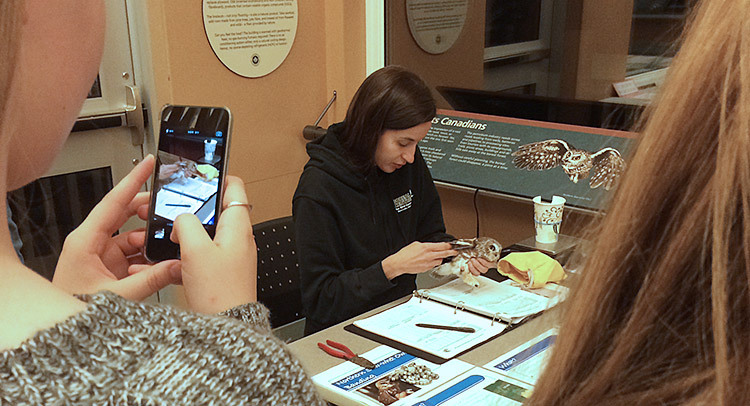 Data gathered through banding will provide further insight into population demographics and biometrics of the owls. Please see the Research Library section for a peer reviewed article on Northern Saw-whet owl migration in Alberta and Saskatchewan. Education is a secondary focus of this project. Owls are an incredible medium to teach the public aspects of bird biology, conservation and the role of bird banding. Please see the education section for more information on our fall owl banding education programs.